There is a throne set in Heaven. It is the same one Isaiah saw in Isaiah 6:1. God, who sits on the throne is described as being like jasper (clear crystal) and a sardine stone (dark red). This was the best way John could describe God’s glory – 4:3 “And he that sat was to look upon like a jasper and a sardine stone: and there was a rainbow round about the throne, in sight like unto an emerald. There is a rainbow about the throne (4:3). Our rainbows on earth are made of red, orange, yellow, green, blue, indigo, and violet. This one appears as an emerald, which is green. Green represents life. Around God’s throne are 24 seats. There are 24 elders, clothed in white raiment, sitting on the seats. They wear crowns of gold (4:4). Lightning, thunder, and voices proceed from the throne of God (4:5). 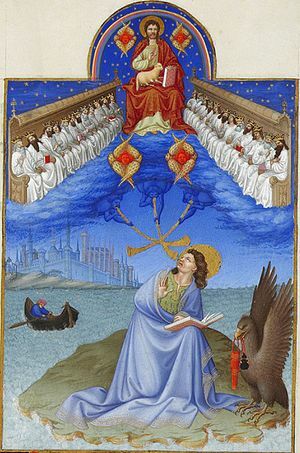 “1 After this I looked, and, behold, a door was opened in heaven: and the first voice which I heard was as it were of a trumpet talking with me; which said, Come up hither, and I will shew thee things which must be hereafter. Most definitely you may share whatever you like. Our Preacher at our church does these teachings for us on Wednesday nights, and it is my desire to share this for the Glory of God. Bless you.